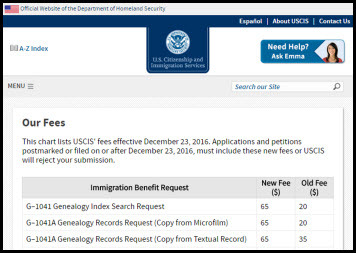 All of us in the genealogical community who need records from the United States Citizenship & Immigration Services (USCIS, formerly INS) have a very short window of opportunity to get records before major fee increases take effect for records searches and retrievals at that agency. In other words, we have a little more than a week to make our final records search requests and records requests at the current fee levels — avoiding the big increases that take effect on the 23rd. USCIS holds some of the most genealogically valuable records on the planet if we have immigrant ancestors who came to the US or created immigration- or naturalization-related records in the 20th century. These include the Naturalization Certificate Files (C-Files), from September 27, 1906 to March 31, 1956; Alien Registration Forms (Form AR-2), August 1940 to March 1944; Visa Files, July 1, 1924 to March 31, 1944; Registry Files, March 1929 to March 31, 1944; and A-Files, April 1, 1944 to May 1, 1951. See this USCIS page for an overview. Right now, anybody who needs copies of these records from USCIS can make a request for a records search — a report back from USCIS as to what records it has for an individual and what the document and file numbers are (and we need those numbers to request those particular records). The fee for that document request is currently $20. Once we have those document and file numbers, we can make a request for a copy of those genealogy records — a C file or an A file, for example — and get it from microfilm with a fee of $20. Or if the records only exist in text form rather than on microfilm, we can get a copy for a fee of $35. But those fees are going up — way up — on December 23rd. All of those fees go up to $65: $65 for the initial search request; $65 for the copy from microfilm; and $65 for the copy from textual records. Now that’s a pretty hefty increase — some 225% for the records search and microfilm copy, 86% for the textual copy. And it’s sure to infuriate those who believe that (a) all genealogical records should be free and/or (b) the genealogical records they need should be free, even if everyone else has to pay for them. But fees at USCIS have remained the same since November 2010 — no fee increases at all. And there isn’t any serious funding provided by Congress for the genealogy program at USCIS. So either the users pay for the service by fees or — and this alternative is unthinkable — the genealogy program at USCIS goes away and we end up waiting until the records are archived at the National Archives (meaning we won’t have access in our lifetimes…). So… if the higher fee really is going to be beyond anyone’s means, the time to act is now. Before December 23rd. In short, if you’ve been holding back and waiting to make a document search request or waiting to order USCIS records, now is the time to get your request in. To make a search request to produce any and all records citations for your person — and you can’t order a record without the record citation number — head over to the USCIS genealogy program web request page right now and pay the current $20 fee to get the request in. If you already have a record citation number, either from a record search or from some other source, you can go ahead and order the record from that USCIS genealogy program web request page for today’s lower cost as well. Remember: like it or not, the fees are going up, to $65 for a records search and $65 for a record copy, on December 23rd. The government’s version of Mr. Scrooge arrives in just a few days… so get those requests in now. Whatever you do, don’t wait. I don’t understand why this agency can’t transfer at least some of these records to NARA. In addition to this increased fee, it takes them 5-6 months to provide information in response to an initial request, then one has to place another order for the particular documents. They have transferred some records to NARA. But they’re obligated to retain others for some time after specific events. Hi Judy, is it worth submitting a separate request for my female ancestors or will they just be included in their husband’s file? The answer is, of course, it depends! Time frame is critical when it comes to women. Marian Smith’s article, ” ‘Any woman who is now or may hereafter be married . . .’ Women and Naturalization, ca. 1802-1940,” in Prologue is must reading to get a feel for the time frames for women. I will go check that out. Thank you! Oh dear, this is not good news. I looked at their website and it’s very confusing. So I need to request an index search first, even if I have the index card from Ancestry/Familysearch? The problem is that you won’t necessarily know what reference number the USCIS needs to retrieve the record by looking at the index card on Ancestry or FamilySearch. The visa number on a passenger record, for example, isn’t the number used by the agency.